The Polynesian dancers who entertained the audience at Stamats’ Adult Student Marketing Conference in Huntington Beach, CA had little to do with higher education. But judging by the smiling faces and the rows of cell phones snapping away, the performance grabbed our attention for fifteen straight minutes and made for a share-worthy moment. That’s the power of good content. This week, Stamats hosted its annual conference bringing together higher ed professionals who are responsible for marketing to adult learners. As universities face stiff competition and declining enrollment in the 25-and-older demographic, universities are being challenged to think differently and explore new ways of marketing their programs. Sophisticated marketers know that content marketing is one of the most effective ways to differentiate your brand, demonstrate expertise, and nurture your leads throughout the purchasing funnel. To help spark new ideas for your content marketing strategies, here are four of my most actionable content marketing takeaways from the conference. We’ve all done it. Choosing to send a text message vs. a phone call. Ordering food from an app vs. calling the restaurant. The higher education industry is also seeing this trend of customers opting out of personal contact. More higher ed prospects are choosing to remain anonymous instead of contacting a school representative for information, at least until they narrow down their short lists — usually down to only three schools according to LinkedIn research. During their presentation, Dan Roelke and Typhaine Morrison from the University of Wisconsin School of Business demonstrated why reaching and nurturing prospects earlier in the decision journey is important. According to their admissions teams, 76 percent of applicants are “stealth” — meaning they apply for a program without speaking with a representative and entering the traditional nurture stream. Further analysis showed that these stealth applicants didn’t matriculate into enrolled students at a very high rate. The yield rate for these stealth applicants was only 49 percent, compared to a 74 percent yield rate for applicants who were nurtured as an incoming lead. “Reaching people high up in the funnel is really important,” Typhaine said. By encouraging prospective students to raise their hand as a lead earlier in the decision journey, universities are able to develop that relationship with prospects, answer their questions and concerns, and ultimately convert them to an enrolled student at a higher rate. For many universities, one of their key differentiators is the unique experience —such intimate class sizes, accessible professors, collaborative peer groups. The challenge is how do you authentically convey that in your advertising? How do you allow prospects to “test drive” your program? 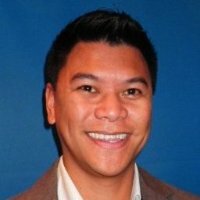 The answer: connect prospects and applicants with students. 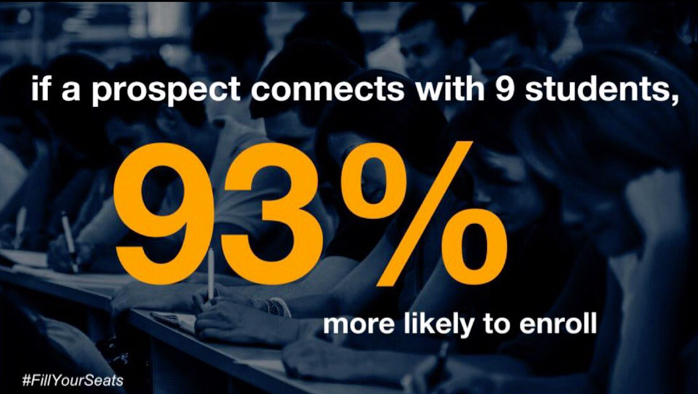 Connecting a prospect with nine students becomes a daunting task, especially when you multiply it by hundreds, perhaps thousands, of prospects. But if you have the proper technology systems in place — ie. campus-wide CRM systems and LinkedIn — the process becomes much easier. “Technology improves the student experience by gathering more information, allowing you to deliver on unexpressed needs and drive customer loyalty,” Niles said. Delivering on prospect and student expectations is going to be a defining factor in this modern age of instant gratification. 3) Need content? Try using the content from your courses. One of my favorite sessions from the conference came from Berklee Online, the largest online music school in the world. 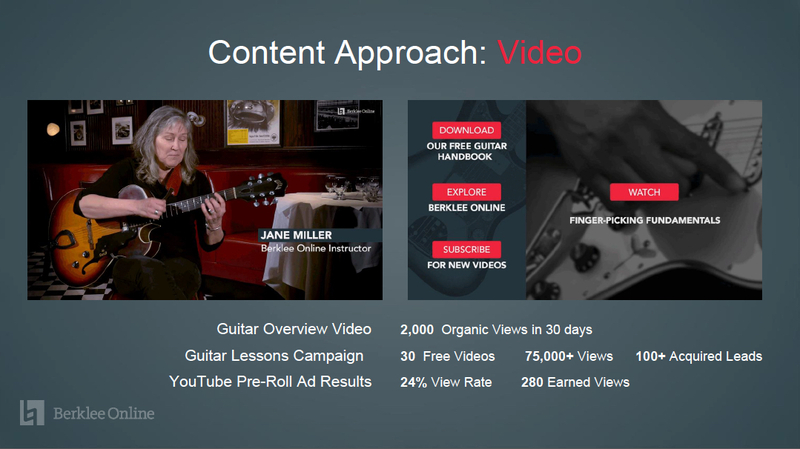 Partly because I wish I could play electric blues like Stevie Ray Vaughan, but mainly because Berklee demonstrated a rarity in higher ed marketing today — true content marketing. Mike King, VP of Enrollment Marketing, and Emily McInerney, Associate Director of Marketing, shared how they used pieces of content that already existed from their online courses and marketed them as free videos, YouTube pre-roll ads, and video overviews. This approach has delivered outstanding results. Berklee offered an excellent example of how a university’s greatest assets — faculty expertise and course instruction -— can be packaged to offer valuable content in exchange for prospect information. How can you package existing online courses or faculty videos in a way that provides value to prospects? Chances are, you’re sitting on a gold mine of content that also demonstrates the thought leadership and expertise of your institution. 4) Outcomes are the new rankings. Rob Humphrey, Senior Account Executive from LinkedIn, dropped this memorable line during his session on the new student journey. Higher education has had a love-hate relationship with rankings for the past couple of decades. Now with increased access to outcomes data and increased demand for proven ROI, prospects are motivated and able to do their own research to determine which programs will deliver the outcomes they want. LinkedIn’s Alumni Tool provides real-time outcomes of university alumni on our platform. 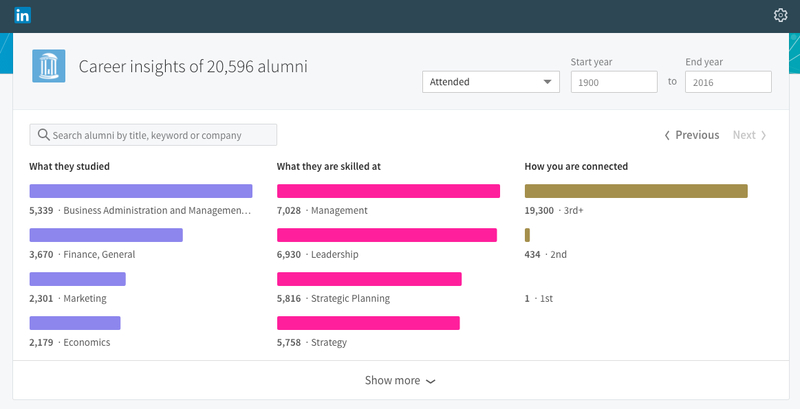 Marketers and enrollment advisors can leverage this tool in prospect conversations to show exactly how alumni from their school achieved specific career outcomes — not to mention the powerful alumni network they’ll be a part of upon graduation. It can also be a way to zero-in on potential alumni testimonial candidates who can tell authentic stories about career outcomes. The best ideas in education marketing come from outside education. Check out our Sophisticated Guide for Marketing on LinkedIn and learn best practices gleaned from some of the top advertisers on LinkedIn.